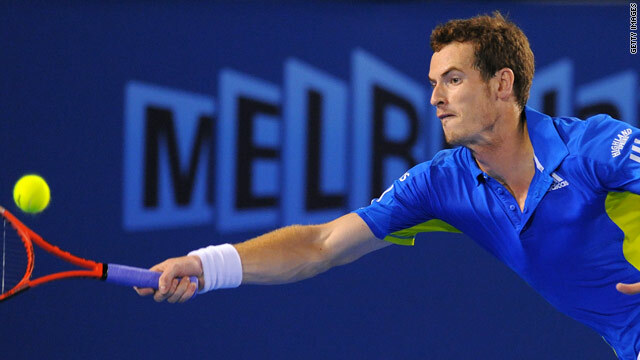 Andy Murray was in dominant form as he cruised into the second round of the Australian Open in Melbourne. (CNN) -- Second seed Rafael Nadal and fifth seed Andy Murray are both trough to the second round of the Australian Open in Melbourne after opening the tournament with straight sets victories. Briton Murray crushed South African qualifier Kevin Anderson, ranked 147 in the world, 6-1 6-1 6-2 in one hour and forty minutes -- while defending champion Nadal recovered from a slow start to overpower Australia's Peter Luczak 7-6 6-1 6-4. Murray, 22, hit 37 winners and lost just two points at the net on his way to his impressive victory. "I could have served better. It was a good start, he's a tough player. He beat (Novak) Djokovic before in Miami so I wasn't expecting it to be easy. I got off to a good start, which helped," he told reporters. "I broke him straight away, that always makes a big difference," added Murray about a match that was played under cover due to rain at Melbourne Park. Spaniard Nadal looked tentative in the early stages of the night-session match at the Rod Laver Arena and only came to life when 30-year-old opponent Luczak served for the opening set at 5-3. Elsewhere in the men's draw, seventh seed Andy Roddick beat Dutchman Thiemo de Bakker 6-1 6-4 6-4, dropping only nine games in the process. De Bakker's 17 aces were in vain as the American cruised into the second round. U.S. Open champion Juan Martin del Potro was made to fight harder against American Michael Russell in a 6-4 6-4 3-6 6-2 win while 11th seed Fernando Gonzales of Chile defeated Belgium's Olivier Rochus, 6-3 6-4 3-6 6-1. Away from the courts, 11 people were ejected from the arena for unruly behavior, while Victoria state police confirmed that eight people had been refused entry to Melbourne Park, British newspaper The Times reported. Superintendent Jock Menzel confirmed: "11 people were disruptive, there were standing on seats and were causing problems for other spectators who were there to watch the game. "Tennis Australia and Victoria Police, we won't tolerate poor behavior and we've demonstrated that. We're here to set a standard. Our mission is to make sure the event occurs in a happy and safe way and that people are safe, and we're going to make sure that occurs." The Australian Open has been blighted with racial tension with recent incidents prompting an increase in police numbers.